Sviests – Butter – is a pure product, the best one can get from milk. In this time of margarine we invite to realise and return to values that have stood the test of time. Real values that we can enjoy and be proud of. It takes hard and accurate work to churn butter from milk and cream, to reach the stage when the unnecessary is separated and only the most valuable stays. This is what the music groups in SVIESTS do – they explore and research the ancient traditional music and churn, churn until the very essence appears and the nowadays topical and unheard appears. In the 1930ies butter was one of the main Latvian export-goods that we sent to other countries and that we were proud of. SVIESTS – “butter” – also has a slightly ironic meaning, because until recently we could often hear about traditional or ethno-music a certain attitude – „kas tas par sviestu!” meaning – “what is this rubbish” (literally “this is butter!”). The Ethno-Music compilation SVIESTS was launched in 2005. Since then this compilation has been released every second year, providing an overview of what is going on in the Latvian “post-folklore” scene. The Ethno-Festival „SVIESTS” strives to feature music, that is based in the ancient past, in the tradition, but has surpassed the test of time and has reached nowadays and is resounding in a way that is enjoyable for contemporary listeners preserving the ancient message. If we look into the past where the songs and music originate from, we cannot speak only about Latvian folk music, because Latvian people were formed from many different more or less related tribes, that had lived and loved and fought against each other or together through the centuries. But together they formed the culture region of the Balts – which today is Latvia, Lithuania, Eastern Germany, Northern Poland, Byelorussia, and parts of Russia. In these areas the hydronimes (names of rivers and lakes) have preserved traces of the ancient inhabitants till nowadays. It is sad that so few information has been preserved about Curonians, Semigallians, Selonians, Latgalians, Samogitians, Scalvians, Prussians, Lithuanians, Aukštaititians, Yotvingians, Sudovians and Galindians. Also in Western Europe, when looking into the past, mainly Vikings, Slavs, Germanic tribes or Bretons are mentioned. But about the Baltic tribes information is scarce. Many of the differen Baltic languages have vanished too, only some songs in Old Prussian or Curonian have been preserved, thus making the still living Latvian and Lithuanian languages particularly precious. The term Baltic tribes has been romanticised and partly misused and covered with different myths and legends. However – the archaeological findings as well as researches in the origins of the languages, different words, songs and tales that show ancient rites and beliefs provide evidence of a distictive, rich and thick cultural layer on which we all still live nowadays. 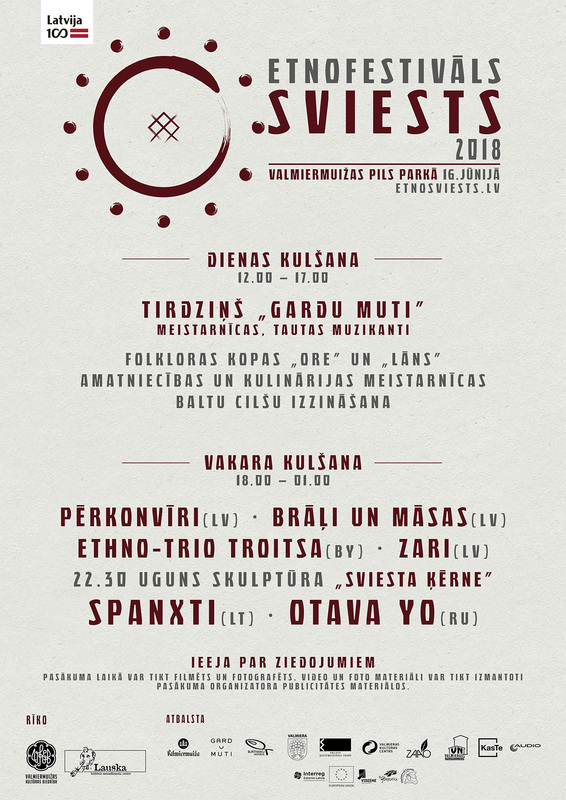 The Ethno-Festival „SVIESTS” represents traditional culture and its different manifestations – music, crafts, also food – everything that is based in its immediate environment and local tradition, and thus can be understandable and enjoyable also to people nowadays, who live in this same environment. If we gain a deeper understanding of our own traditions and cultural treasures that originate in the past, we can avoid superficial stereotypes. It is also very enriching to be aware of our personal culture layer and integrate some ancient elements that have surpassed the test of time, into our contemporary life. The festival strives to show artists of different disciplines, crafts people, but first and foremost musicians, who have succeeded in integrating some of these elements into their contemporary creative expressions. In 2017 the Ethno-Eco Festival SVIESTS has found a new partner – the Valmiermuiža Culture Society, who over the past years has developed their location in Valmiermuiža into a regional culture centre, that organises the summer solstice event „Saulgriezis”, and also was the venue for the Valmiera Theatre Festival. Throughout the year it invites different musical groups to concert evenings. 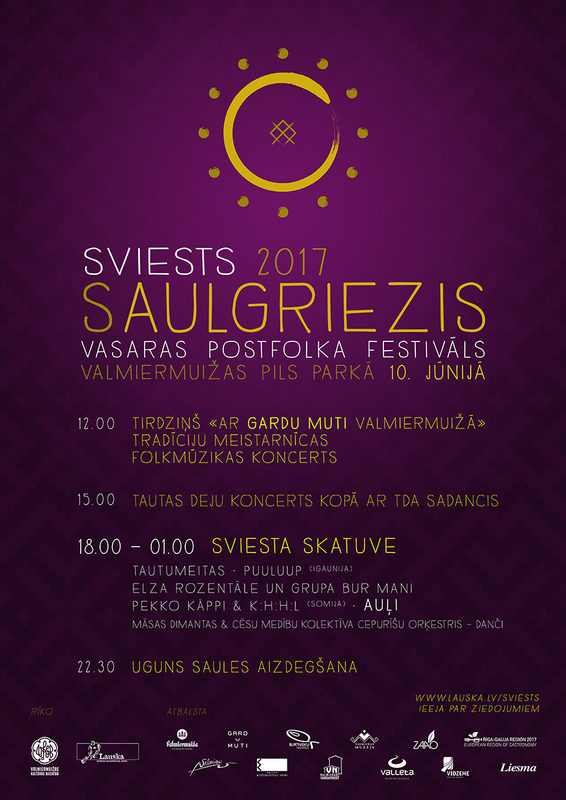 This year the event „Saulgriezis” will host the SVIESTS stage for Latvian ethno-music groups as well as international guests. In 2016 the fourth Ethno-Eco Festival SVIESTS took place in Cēsis, where special international guests were ethno-musicians from our nearest neighbouring country – Estonia, but which we still know unjustifiably very little about. 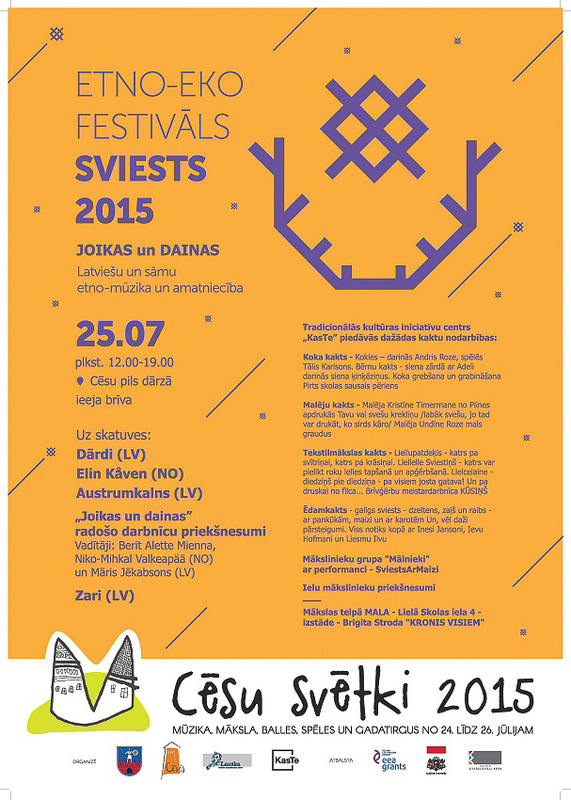 In 2014 and 2015 the Ethno-Eco Festival SVIESTS was part of an EEZ Grant Culture exchange project „Joikas un dainas”. 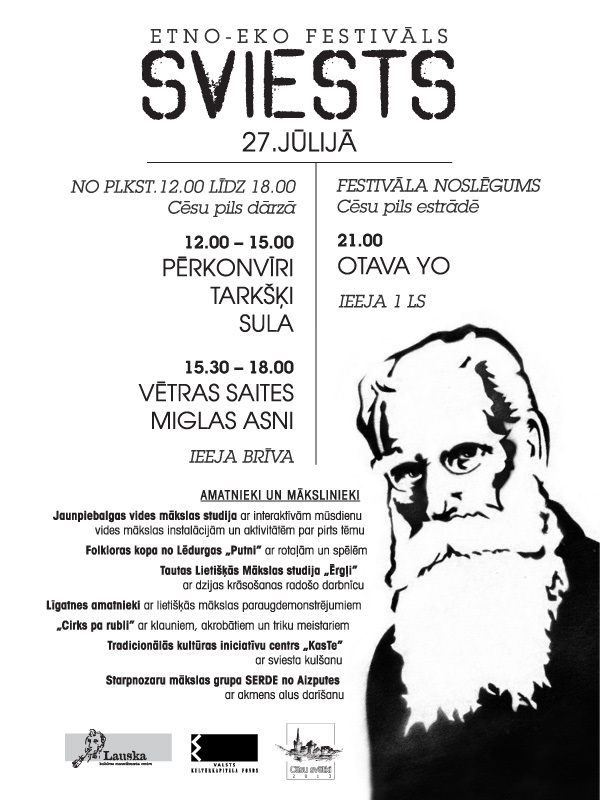 SVIESTS co-operated with a Sami festival ISOGAISA in Norway and exchanged both musicians and craftsmen, organised concerts and creative workshops, where Latvians were introduced to Sami crafts and music, but Latvian musicians and craftsmen travelled to and introduced their traditional culture to visitors of the festival ISOGAISA in Norway. 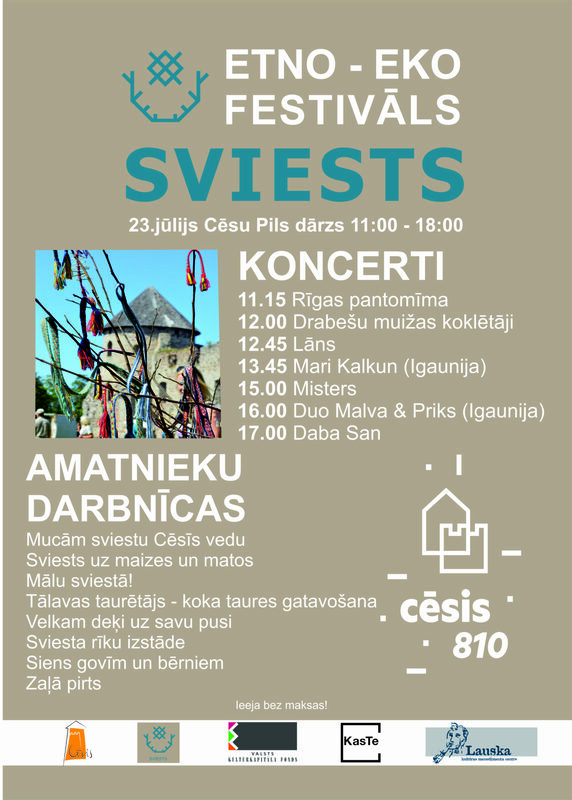 In 2013 SVIESTS turned into a one day festival in co-operation with the Cēsis Culture and Tourism Information Centre – the Ethno-Eco Festival Sviests – that was held during the Cēsis city festival. The festival programme included music groups that were featured in the Sviests album as well as international guest musicians. The festival also offered an interactive craftsmen programme, where visitors could observe artists and craftsmen showing their work and also create something nice, useful or tasty themselves. These proven values – being in harmony with one’s own natural and cultural environment – which ensure a high quality of life, is what we want to transmit with our activities, of which one of the most visible is the Ethno-Eco Festival SVIESTS.